Upon a recent trip to a nursing home to visit family in Oklahoma, I was struck by the very visceral memory of experiencing a nursing home as a child. The fragility and hopelessness. The masses of elderly souls in the hallways, bent over, sleeping in their wheel chairs. The pungent sour and medical scent in the air. The sadness and emptiness. The despair. Was this simply my interpretation, or did the elderly also feel this way? As I walked into the main living area, I was holding my six month old baby. Out of nowhere a very senile, but spritely woman came and nearly knocked me over to grab my baby out of my arms. In that moment, I was not so sure what to do. Did I give my precious child over, so that this woman could have the joy of holding a baby in her arms? Were here frail arms strong enough to hold my baby? Would she drop her on that hard nursing home floor? This woman was strangely similar to a small child, holding this baby like her own dolly, taking on that far off childlike fantasy voice. In fact, all of the elderly people there seemed to have been converted back to small children, in some way. Some held a child’s innocence, some held childlike wonder, some were simply as helpless as a newborn baby, at the mercy of the staff who cared for them. I did let her hold the baby… how could I not. The few other conscious people in the room quickly looked over to the baby and the old woman. Slowly, a small crowd started forming around the baby. Just then, I had a strange and unfamiliar sensation. The sensation of being a rock star. Yes, a rock star, if even for a few moments. I am happy to live in my own small world where a baby is the only thing that can bring me to rock star status. Only a small helpless baby can evoke such stardom. In a world where I often have trouble understanding our culture’s values, I would rather not know any other kind of super star. Coming home feeling very humbled, some days later, our little New Mexican abode received a ten day deluge of rain. Our normally dry arroyo temporarily became a roaring waterway. In the days that followed, the water slowed to a softly flowing stream, then to a trickle of water, and finally to a soft and silty damp arroyo again. 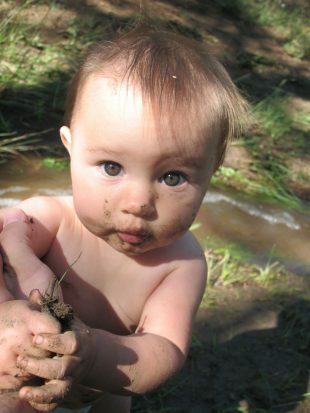 We spent long afternoons playing in the wild and rare “river” we called our own, if only for a time, all of us, children. Splashing and giggling, soaking up the sun, the water washed us clean. Carrying home the heavy and limp limbs of a sun drenched sleeping child from the water, I felt we had slipped into some sort of heavenly realm. I wished to hold on to that moment so tightly that I would never ever forget. After having three children, I am quite convinced that nothing can come close to this divinity called childhood. Their brilliantly creative play, their earnest spirits, their purity and innocence cut right through to the core of our essence as humans. These poignant moments sparked something in my soul, leaving a flicker in me for some time to come. I wish that we all could visit the nursing home, with our children, as children, among the elderly children… and visit the river, once in a while, so that we remember the innocence we all hold in us. How lucky we should be to bear witness the ever so thin veil between childhood and old age.